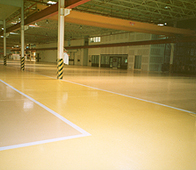 Thin Film Systems | Floor Coatings, Etc. Thin film systems (up to about 12-mils) typically consist of a primer coat of a two component roller applied polyamide epoxy (3 to 5 mils) top coated with one or two applications of a roller applied aliphatic urethane at 3 to 4 mils each. Since these systems are so thin the preparation of the surface is generally restricted to diamond grinding or “Old school” acid etching. Shot blasting (the preferred method of preparation) yields a somewhat rough surface that usually requires 20 mils or more of a 100% solids epoxy to hide. At 20 mils it’s no longer a thin film system. It’s a high build coating. These systems can be used in warehouses, dealership parts rooms, corporate hangars, and other lighter duty areas. Contact us today at 302-322-4177 to learn more about our Thin Film Systems.